William "Bill" Kristol is an American neoconservative political analyst and commentator. He is the founder and editor at large of the political magazine The Weekly Standard and a political commentator on several networks. 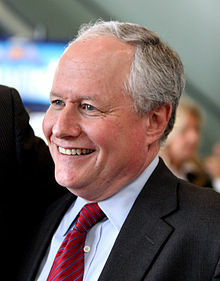 William "Bill" Kristol (born December 23, 1952) is an American neoconservative political analyst and commentator. He is the founder and editor at large of the political magazine The Weekly Standard and a political commentator on several networks. Kristol is associated with a number of prominent conservative think tanks. He was chairman of the New Citizenship Project from 1997 to 2005. In 1997, he co-founded the Project for the New American Century (PNAC) with Robert Kagan. He is a member of the board of trustees for the free-market Manhattan Institute for Policy Research, a member of the Policy Advisory Board for the Ethics and Public Policy Center, and a director of the Foreign Policy Initiative. He is also one of the three board members of Keep America Safe, a think tank co-founded by Liz Cheney and Debra Burlingame, and serves on the board of the Emergency Committee for Israel and the Susan B. Anthony List.